One of the most famous hotels in Dubai, this is an iconic marine-themed resort on the tip of the world-famous Palm Island. A playground for holiday makers of all ages, this hotel is ideal for an extravagant beach escape with easy access to the buzzing city centre. On the crescent of the Palm, around 45 minutes from the airport. The lavish rooms reflect the hotel’s unique nautical theme. 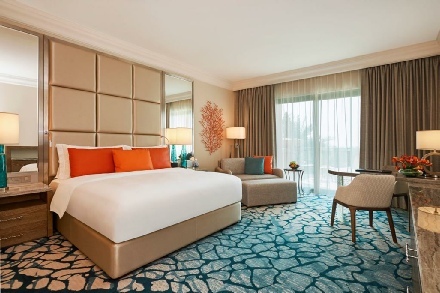 Spacious Deluxe Rooms overlook the hotel, the Palm Island or the Arabian Sea from a private balcony. Upgrade to an Imperial Club Room and you’ll enjoy access to an exclusive dedicated lounge with a huge range of additional inclusions. From a personal concierge service to access to the exclusive Imperial Club Beach, complimentary canapés to fast-track entry to Aquaventure Waterpark, and free entry to N’Dulge Nightclub to Atlantis Kids’ Club for children – the list of extras is more than enough to impress. Variety is the ethos at Atlantis The Palm, Dubai. There’s a choice of over of 23 celebrity, speciality and casual dining restaurants, bars and lounges. As part of the Half Board meal plan, you’ll be able to choose from 14 restaurants offering Arabic, Asian, Mexican, Thai and international cuisine (a supplement applies for some restaurants). 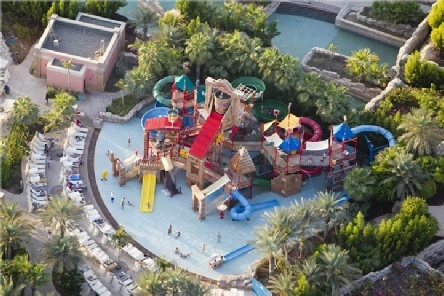 Thrill seekers will enjoy complimentary access to Aquaventure Waterpark with its world record-breaking rides and The Lost Chambers Aquarium, while those that enjoy a bit of socialising will love Nasimi Beach, home to some of Dubai’s best beach parties at the weekend. There is a kids club and a teens club. ShuiQi Spa & Fitness offers a range of treatments and modern facilities. Indulge in some truly relaxing therapies, from Sisheido to ESPA and Batien Gonzalez foot therapy. 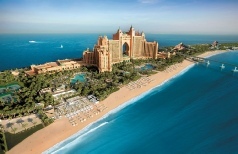 2019 package holidays to the Atlantis The Palm Dubai Prices are per person based on two sharing.